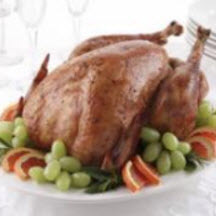 Roast turkey with oyster stuffing is particularly popular with New Englanders. For Stuffing: In 2 shallow baking pans or jelly-roll pans, arrange bread cubes in one layer. Bake in a preheated 325°F (160°C) oven for 10 15 minutes or until golden. Transfer to a large bowl. In a large skillet, cook bacon over low heat, stirring as needed, until crisp. Remove bacon from pan and add garlic, onion, celery, sage and thyme. Cook until vegetables are soft. Add to bread mixture. Stir in parsley, melted butter, oysters, bacon, salt and pepper. Lightly toss stuffing, mixing well. Allow stuffing to cool. For Turkey: Rinse turkey, pat dry and season inside and out with salt and pepper. Loosely pack neck cavity with some of the stuffing, fold neck skin under body and fasten it with a skewer. Loosely pack body cavity with some of the remaining stuffing. Truss the bird. Transfer remaining stuffing to a buttered 3-quart baking dish and reserve, covered and chilled. Coat the exterior of the turkey with 1/4 cup butter. Roast turkey on a rack in a shallow roasting pan in a preheated 425°F (220°C) oven for 30 minutes. Immediately reduce oven temperature to 325°F (160°C). Saturate a large piece of cheesecloth with remaining 1/2 cup melted butter. Baste turkey with pan juices and drape breast with butter ladened cheesecloth. Baste turkey every 20 minutes and continue to roast for 2 1/2 to 3 hours or until the internal temperature measures 170°F (80°C) in the breast and 180°F (85°C) in the thigh. Meanwhile, during the last 1 1/2 hours of roasting, drizzle the reserved stuffing with stock, cover and bake at 325°F (160°C) for 1 hour. Remove cover and continue to bake for an additional 1/2 hour. Discard cheesecloth and string from turkey. Transfer turkey to a heated platter, reserving juices in the pan. Loosely cover turkey with foil and keep warm. For Gravy: Skim all fat from the pan juices, reserving 1/3 cup fat. Add wine to pan. Deglaze pan over moderately high heat, scraping up brown bits. Boil until the mixture is reduced by half. In a saucepan, combine the reserved fat and flour. Cook the roux over moderately low heat, whisking for 3 minutes. Whisk in stock and wine mixture. Continue to cook until gravy simmers. Simmer an additional 10 minutes. Add reserved cooked and chopped giblets and neck meat. Season with salt and pepper to taste. Cook and stir until gravy returns to a simmer and continue to cook and stir for 2 more minutes. Transfer to a heated sauceboat. Garnish turkey with parsley and thyme sprigs. Note: Stuffing can be prepared 1 day in advance, covered and chilled. To prevent bacterial growth, never stuff the turkey cavity in advance.